"It's a Jungle Out There!" 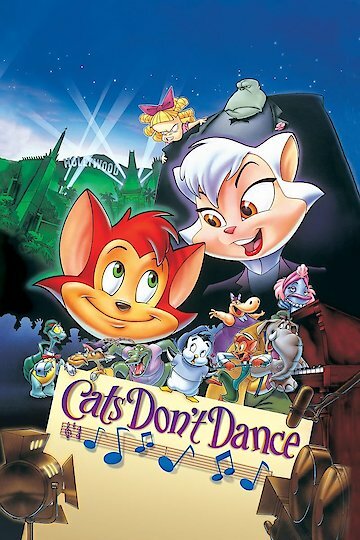 Cats Don't Dance is an animated comedy from 1997 that takes place within a world that pairs anthropomorphic animal characters with humans. The film's protagonist, a talking cat named Danny, has always dreamed of making it big as a Hollywood actor. After he finally sets off for California, his dreams are soon mollified upon discovering that animals only get bit parts these days. Rather than settle like so many other animal performers, Danny seeks to overthrow the stranglehold on Hollywood that Darla Dimple, a spoiled child actress, seems to have over the industry. Cats Don't Dance is a G-rated film. Cats Don't Dance is currently available to watch free on Vudu Free and stream, download, buy on demand at Amazon, Vudu, Google Play, iTunes, YouTube VOD online.